This page is in honour of Dr Ray Miller and his team of actors, designers and technicians and Professor Kevin Warner, Chairman of the Theatre and Dance Department at Appalachian State University (ASU). 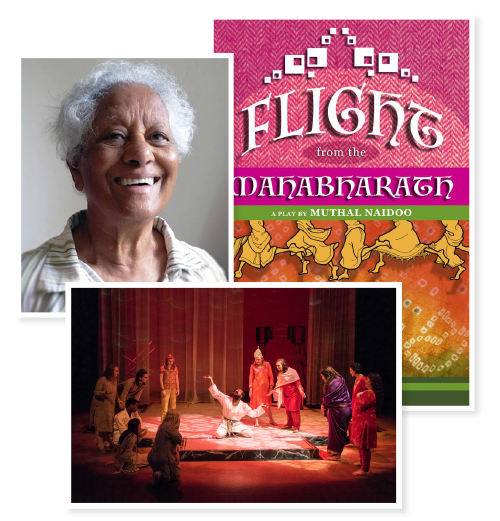 From April 26 to April 29, 2017, I was at ASU in Boone, North Carolina, attending the Theatre and Dance Department’s production of my play, Flight from the Mahabharath. Dr Ray Miller, director and choreographer of the play, had invited me to attend the performances and I was there as guest of the Department. I had written Flight from the Mahabharath sometime in the early 1990s, after I had watched the Chopra brothers’ television dramatization of the epic, the Mahabharata. At the time I was also reading the works of the radical feminist author, Mary Daly, Professor at Boston College, whom I greatly admired. And as I watched the televised serial, Mahabharat, I was appalled at the way in which women are portrayed in the epic and felt impelled to counter such a portrayal. So I wrote Flight from the Mahabharath, in which women abandon the epic and create a play in which they free themselves of stultifying traditions and redefine themselves in terms of their individual understandings of who they are. Determined to dedicate myself to writing after I retired from teaching in 2000, my first thought was to capture the history of Marabastad (The Asiatic Bazaar), the location in which I had lived as a child. I immediately set about interviewing people who had lived in the location. During my interviews with Sinthumbi Naidoo, he made me aware of his concern that Tamil religious practices were losing their meaning for Tamil South Africans and suggested that I work with his son, Ronnie, a poosari, to put together a manual that explained the meaning of the rites. That is what we did and A Little Book of Tamil Religious Rituals was published in October 2004. In between interviews for my book on Marabastad, I began recording my experiences as a teacher in Limpopo Province and day-to-day happenings, my friendships, my hijacking, a wedding in the family, among other things and compiled a book of short stories, Jail Birds and Others , which was published in December 2004. Soon afterwards, I completed Stories from the Asiatic Bazaar and it was published in 2007. Stories from the Asiatic Bazaar can be purchased from IQRA Agencies in Laudium. In 1994, South Africa became a democratic country but the racism into which we had been socialised did not disappear at the stroke of a pen and writers continue to reflect experiences gained through racial and cultural balkanisation. Consequently, varying racial, ethnic and cultural experiences, do not find affinity across the board. And publishers, concerned only with markets, are unwilling to takes risks with unknown writers. They told me time and again that there was no market for my work so I decided to go into publishing. 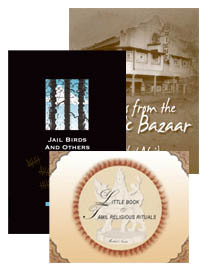 I have published A Little Book of Tamil Religious Rituals, Stories from the Asiatic Bazaar, Monkey Business by my sister, Seetha Ray, and am working on a book of children’s plays by my brother Seeni Naidoo, a short story that he has written, more short stories, a novel and three novellas and children’s stories that I have written. I spent the years 1977 to 1983, involved in Anti-SAIC and UDF campaigns, which inspired me to write a number of plays: We 3 Kings, a farce about ‘Indian’ elections, Ikhayalethu, about dispossession, Masks, the search for African identity. One of my revues, The Masterplan, a comic interpretation of separate development and the Tricameral Parliament, was banned in September 1983. My last play Flight from the Mahabarath, written sometime in the 1990s, is a feminist critique of the epic. Going through my papers, I discovered a number of articles written over the years so I revised them and put them all together with new articles. They include reflections on drama, reactions to apartheid, reflections on writing, my joy at discovering Milan Kundera and my attempt to understand the functions of religion and democracy in a society. It is with utmost urgency that I draw to your attention the proposed development of Rietfontein Farm 61IR, situated bordering Linksfield Rd, Club Str, N3 highway and Modderfontein Rd. This area contains the Site of the Historic Rietfontein Isolation Hospital. The growth and development of the individual is made possible by the security of living in community – a person is a person through other persons – ubuntu. The aim of democracy is to provide the security that allows for maximum individual freedom. Democracy from demos (people, awethu) and kratos (power, amandla) – amandla awethu – government of the people, by the people, for the people is based on the ideals of liberty, fraternity and equality. Fraternity and equality translate into responsibility and respect for others. To write what he does, in the way he does, Eusebius McKaiser has to be a man who understands exactly who he is and what he believes. So he writes with a refreshing frankness, putting his experiences under the microscope and finding meanings that have given him a greater understanding and appreciation of the circumstances under which he lives. As he is a South African, his insights help us all to hold the spotlight up to our attitudes and beliefs.